G.K. Beale, writing in The Temple and the Church’s Mission: A Biblical Theology of the Dwelling Place of God (Apollos/IVP, 2004), argues that “We should want to follow an interpretive method that aims to unravel the original intention of biblical authors, realizing that that intention may be multi-layered, without any layers contradicting the others. Such original intentions may have meaning more correspondent to physical reality (hence so-called ‘literal interpretation’) while others may refer to ‘literal’ spiritual realities…” This means that “the progress of revelation certainly reveals expanded meanings of earlier biblical texts. Later biblical writers further interpret earlier biblical writings in ways that amplify earlier texts. These subsequent interpretations may formulate meanings that earlier authors may not have had in mind but which do not contravene their original, essential, organic meaning. This is to say that original meanings have ‘thick’ content and that original authors likely were not exhaustively aware of the full extent of that content. In this regard, fulfilment often ‘fleshes out’ prophecy with details of which even the prophet may not have been fully cognizant” (p. 289). During the early years of expectation, the son reflects on the particular size of the buggy, its contours and style, its beautiful leather seat and the size and breed of horse that would draw the buggy. Perhaps the father had knowledge from early experimentation elsewhere that the invention of the automobile was on the horizon, but coined the promise to his son in terms that his son would understand. Years later, when the son marries, the father gives the couple an automobile, which has since been invented and mass-produced. 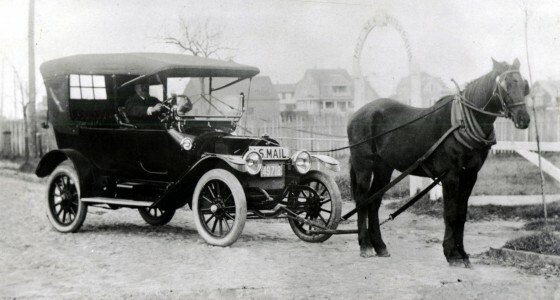 Is the son disappointed in receiving a car instead of a horse and buggy? Is this not a ‘literal’ fulfillment of the promise? In fact, the essence of the father’s word has remained the same: a convenient mode of transportation. What Did the Old Testament Writers Know and When Did They Know It?